Morgan Knibbe, Those Who Feel the Fire Burning, 2014. All rights reserved.It is said that drowning is one of the most painful ways to die. The involuntary survival instinct to breathe takes over any rational knowledge that your body has succumbed to the weight of the water. At which point, your lungs just burst. Your brain is supposed to associate the pain with that of burning. This experience of powerlessness, of mind over body, of man over nature, was shared by over 1,800 people in the first six months of 2015, as they tried to cross the Mediterranean sea into Europe. When Morgan Knibbe began filming his ambitious boundary-blurring film, Those Who Feel The Fire Burning, migrant deaths were five times less and the Mediterranean sea had not become the news sensation and major headline it is today. But it’s not about the numbers, Morgan Knibbe tells us, in this experimental, cinéma du corps film, which features a (literally) floating protagonist, a deconstructive and cyclical narrative, and a troubling existential discussion of the boundaries between life and death. Because, as we are all made aware now, some have neither the power to choose how they are forced to live, nor how they are forced to die. We are aware of this the same way we are aware of the vast watery cemetery that our ocean has become. Those Who Feel The Fire Burning opens with the death of a migrant during his family’s escape via boat to Europe. He continues his lifeless existence throughout much of the film, as he floats across an anonymous Europe, bearing witness to the lives (and lifelessness) of those who made it across. We are invited into his thoughts, as he accepts death, mourns his family and is tortured by the revelations of migrant life in Europe. To his disoriented questions about time and place – “Where am I?” – supplanted by powerful drone footage of the archetypal Mediterranean-city-by-night, we are offered scenes of the European mirage that lured so many to their death. It is a land beyond the sea-grave, where the grass is not greener. And yet we hear a young Senegalese migrant whisper “this is my third or fourth time”, before another man is overheard in a homeless gathering saying: “I thought getting to this country would be the hardest part.” With each new face, the one preceding it becomes deflated. Each one is crueler than the other and with each new story we feel the relief the dead narrator feels for having discontinued his bodily journey by the sea. Critics have found some obvious similarities between Knibbe and the cinematographic style of Terrence Malick and Gaspar Noé, but I only see Kafka in his existential metamorphosis of being and nothingness. One of the most brilliant scenes follows a cockroach starting its journey on the filthy walls behind a middle-aged Senegalese man, making its way up the door frame, out of the room, on the ceiling, into the darkness. Freedom. Darkness is as much freedom as it is death in Those Who Feel The Fire Burning. Even the cockroach has more bearing and power of movement than the man. Just like Kafka’s Metamorphosis, the ‘migrant’, as a form of personhood, is transformed into a foreigner, an isolated lonely being even before embarking on that defining journey. He is outcast long before he reaches his final destination, where his humanity is seemingly honoured and acknowledged even less. Like Kafka, the question is no longer if there is something that can be done. The answer is almost always ‘no’. The real question is can we bear to sit there and watch. Those Who Feel The Fire Burning ebbs and flows through the countless lost souls at sea, grounded on a land that is never theirs, dying on the concrete or by the needle. And then it stops. I counted 20 coffins being raised onto a ship, the sound of the machines drowned out by the unspeakable misery of loved ones coping with each new death. 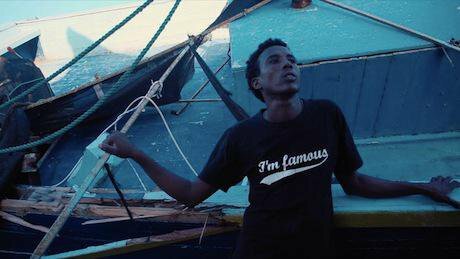 There is no narrator in this final part, an adaptation of Knibbe’s award-winning short film Shipwreck of the October 2013 tragedy, in which a boat with over 500 Eritrean migrants sunk off the coast of Italy. It feels like an entirely different film, because it is entirely different. The transition destabilizes the ethics of the movie and cuts short the initial journey. For the first time, we are offered the point of view of grieving survivors, forced to watch their loved-ones departing in wooden, if still European, coffins. All drifting metaphysics are erased, once the brutal reality of the migrant journey is revealed. It is a powerful and effective ending, which unfortunately unearths and outweighs the rest of the film. The pseudo-subjective, free-flowing, drowned narrator and witness, is sealed shut and forbidden to speak or grieve once the wooden coffins come into focus. Suddenly death regains its brutally concrete existence, reduced to wooden boxes, stacked in rows of two and it beckons us to reconsider the torture of drowning in itself, but also the torture of knowing, say, your sibling was taken from you in this manner. It is no longer about the cruelties one escapes at home or the cruelties one faces in Europe, but only the fact that very few get the ‘luxury’ of a European coffin and a final send-off by their family. The Mediterranean sea engulfs the rest. Those Who Feel the Fire Burning is screening at the Open City Documentary Festival on 17 June 2015.